Last night marked the second Mashable-sponsored Social Media Day here in Buffalo. With 154 RSVPs for the event, the venue, The Eights Bistro, saw a steady churn throughout the night as people came and went (but mostly came and stayed). If you were not there then you can catch up with some of the activity by viewing the Twitter stream, tagged with #smdayBUF. There were many photos throughout the evening, and as some of the albums start to show up I will link them here. If you have one you want linked, please pass it along. This includes any video or news coverage. The list of sponsors is pictured below, and they were all kind enough to generate door prizes, services, time and effort. As I said above, if you have your own images, videos or links, please send me the links or comment below. Buffalo Rising pre-event coverage, written by Social Media Club Buffalo chapter president. Photos from Buffalo.com (#18 shows my awesome QR code shirt, and #27 makes me glad I sucked in my gut). Photos from Clark Dever, who provided photography services for last year’s event as well. Social Media Club Buffalo: #TacoVino, December 10, 2010. Buffalo Launches Social Media Club Chapter, September 23, 2010. 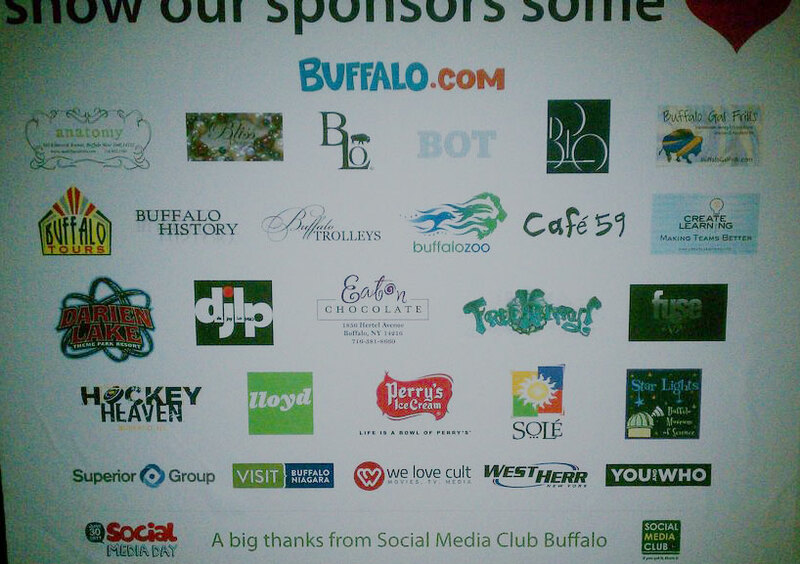 Event Profile: #smdayBUF & #smdayBUF 2.0, August 12, 2010 (posted at City Love Cloting). Social Media Day in Buffalo #smdayBUF, July 1, 2010. For real, though, can't wait to see more. Love the post! @buffalogal, @k8creative, @dangigante, @ecollins7, @ashleiJ, @Isimon33, @aaronpsmith, and @djlopro deserve awards for this event.